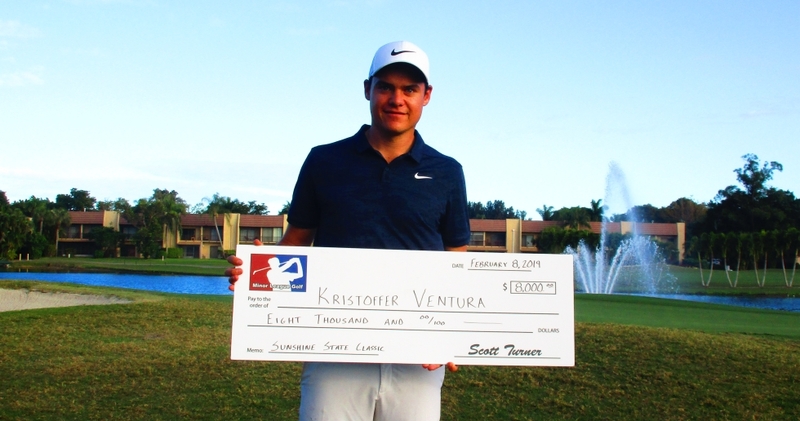 LAKE WORTH, Fla. – Kristoffer Ventura of Norway scored his second victory in five starts on the Minor League Golf Tour, winning the Sunshine State Classic by two strokes Friday on the West course at Fountains Country Club. Ventura, 23, shot 67-66-64 for 197, earning $8,000 from the $37,300 purse. 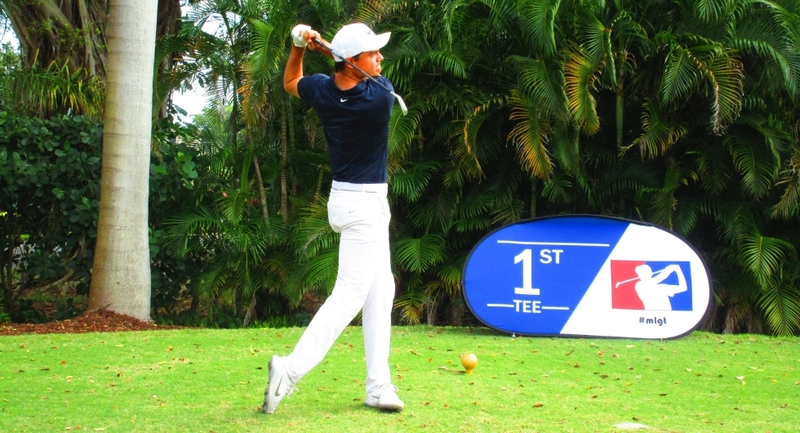 He won in his first MLGT appearance Jan. 9 at Abacoa Golf Club. In 54 holes here, Ventura had 19 birdies and three bogeys, two the first round and one the second. Tied for second at 199 were Brian Carlson of Madison, CT, who also closed with 64, and Billy Walthouse of Longmeadow, MA, whose 63 on Thursday equaled the low score of the week. Overall, Carlson had 18 birdies and 4 bogeys, Walthouse 17 birdies, a bogey and a double bogey, at the par-5 12th hole the second round. Ventura played his college golf at Oklahoma State University and was ranked as high as 24th in the world as an amateur. Since turning professional in the summer of 2018, he earned conditional status on the Web.com Tour through Q-School and is looking to improve that status during 2019. 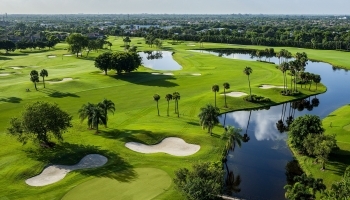 The fourth Sunshine State Classic drew 59 entries. The 36-hole cut left 23 players for the final round. None of the three past champions had entered the tournament. A big thank you to Fountains Country Club and it's members for hosting the event. 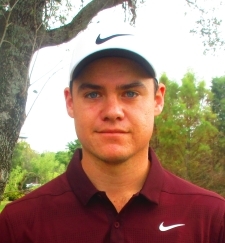 LAKE WORTH, Fla. - Billy Walthouse from Longmeadow, MA made 10 birdies en route to a second round 63 and a 36 hole total of 130 on the West course at Fountains Country Club. He will take a three shot lead over four players into the final round of the 2019 Sunshine State Classic. First round leader David Pastore followed up 63 with 70 and will join Zach Zaback, Kristoffer Ventura and Al Dickens entering the final round in a tie for 2nd three shot behind Walthouse at 133. The cut fell at 2-under par 140. The top 33% and ties (23 players) made the cut. There were two skins out on day two worth $360 each. Click on any of the $ signs under the skins/total column to view the skins results. LAKE WORTH, Fla. - David Pastore from Greenwich, CT was error free in his opening round 63 on the West course at Fountains Country Club. He eagled the par-5 third hole and added 6 birdies to take a two shot lead over Justin Hicks who also was bogey free on day one. The field wil be cut to the low 33% and ties (20 players) after day two. Right now there are exactly 20 players at 2-under par and better. There were two skins out on day one worth $360 each. Click on any of the $ signs under the skins/total column to view the skins results. The 4th Annual Sunshine State Classic. There will be a 36 hole cut to the low 33% and ties. $10,000 1st Place with 72 Players. $5,000 Guaranteed 1st Place at any number of Players. Solo last place after cut earns at least their entry fee.